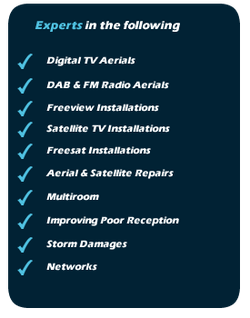 Freeview is the simple way to enjoy 60 digital TV channels and 25 radio stations through a digital television aerial. All new flat screen televisions have freeview already built-in. With a freeview + recorder you can make most the most of this free service having the ability to pause, record and rewind. More and more people today are using Freeview digital recording and HD services than ever before, with this package you’ll be able to receive some amazing features, which in the past were only limited to Sky customers. Before we begin the aerial installation, we will take time to make some checks, which will allow us to correctly gauge what installation service will be best suited for your budget and home. We also stock Freeview + and HD recorders should you require one as part of the installation. Then, after a few hours your home or business will be connected!